The Pelican Bay Services Division completed a “Right Turn Only” project last week to improve safety at Gulf Park Drive and US 41. Striping placed on the left turn lane now redirects traffic to the right lane for vehicles to travel south only. 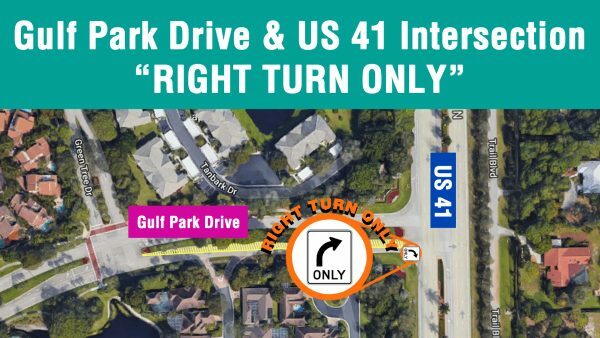 It is important to note that vehicles will no longer be able to cross into the US 41 median and travel north from Gulf Park Drive. Road signage will allow for preparation prior to the end of Gulf Park Drive. Left lane striping will begin west of Green Tree Drive. However, merge lane arrows will be indicated east of Green Tree Drive. Looking for alternatives to travel north? Turn south and change lanes to the next available left turn lane along US 41. Take advantage of the north or south ends of Pelican Bay Boulevard where traffic lights allow you to travel north. The Pelican Bay Services Division will continue to monitor and participate in future discussions to promote save travel in this area.